Sheikh Lotfollah Mosque, located in the Naqsh-e Jahan Square of Isfahan city, was built during the reign of Shah Abbas I of the Safavid dynasty. Plenty of mosaics are used in construction of this mosque. 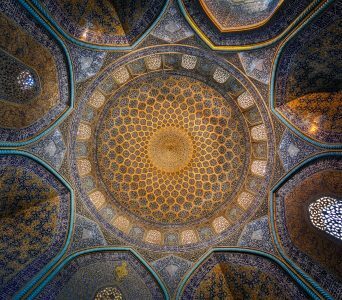 The chief architect of this masterpiece was Sheikh Bahai and many famous calligraphers and artists of Safavid collaborated in its creation. This mosque has a 45 degree angle for adapting to Mecca. Unlike any other mosque in Iran, it does not have a Sahn or a courtyard. Sheikh Lotfollah Mosque seemed to be the most compact Mosque I had ever seen. Upon entering I was met with turquoise mosaics, streams of light from the windows in an otherwise dimly lit space shone onto the tiles, walls and scriptures of Quran, giving the place and ethereal feeling. Before taking this photo I entered the Mosque many times, taking in and relishing its beauty for many hours.